That stands for Self Contained Underwater Breathing Apparatus. The SCUBA system and the modern version of sport diving were invented by Jacques Cousteau in France right under the noses of the Nazis during World War II. By the late fifties and early sixties, the cost of the equipment had come down enough many in prosperous post war America could afford it. TV shows like Sea Hunt staring Lloyd Bridges, which aired from 1958 through 1962 and in reruns for years after, plus The Aquanauts (CBS 1960-61) staring Keith Larson and later Jeremy Slate, played a major role in promoting the sport. By the time I graduated from high school in 1962, I had a strong interest in diving, which, at that time, was limited to snorkeling when we went to Florida on rare vacations there. In the summer of 1962, my friend Dee White announced to the rest of the gang he was taking SCUBA diving lessons. That immediately got the rest of us interested. Buck and I were the first to follow Dee’s lead and promptly begged a diver we knew to teach us how to safely do that. I had been reading everything on the subject I could get my hands on and had developed a bookish knowledge of the sport. It was enough for me to figure out we had chosen the wrong person to teach us. He knew less than we did. By reading and picking the brains of other divers like Dee, we developed what we thought was a satisfactory level of knowledge about the sport and how not to “get bent” or experience an air embolism. We acquired a copy of the US Navy Dive Tables and learned all about decompression to avoid the dreaded bends, which could paralyze and even kill you. So we bought our equipment and went diving. This included: mask, fins, and snorkels, one 72cf tank, one backpack for strapping the tank on our backs, one dive watch for timing our bottom time, one wrist depth gauge, one demand regulator (the thingie that supplied the air in the tank to our lungs), and a spear gun. We were now undersea hunters! I had access to a boat, the Yellow Jacket Buck and I almost sunk on an earlier camping trip to Cat Island. Buck also had access to a boat. Look out Lake Pontchartrain, here we come! The lake was a good place to begin. It was rarely over twenty feet deep anywhere, and back then, it was relatively clear with twenty feet visibility at times. The Causeway bridge stanchions and the powerline towers in the water off the end of Williams Blvd were great fish attractors, mostly Sheepshead with an occasional Jack Cravelle showing up, but the latter was too fast for us to get a shot at them. We shot tons of sheephead and feasted on fish after every trip. Eventually we joined a dive club, and there were many to choose from back in the early sixties with more than a half dozen in New Orleans alone, ranging in size from close to a hundred members (Dixie Divers) to some with maybe only a dozen. We joined the Bajaos, which had 30 to 40 members at any given time with maybe twenty or so who were active. The big three were the Dixie Divers, the Hell Divers, and the Bajaos. Some of the members had been at this for many years and proved to be a helpful source of information. Club membership also provided us with access to diving in the Gulf of Mexico. The Bajaos were named after the Sama-Bajau people of Indonesia, sometimes called the “Sea Gypsies” or “Sea Nomads” because they essentially live on the water and, it is said, get seasick when they go on land. I have experienced this after a three-day dive trip in the Gulf. After all that time on a rocking boat, when I stepped on dry land again, it was moving! I suddenly felt nauseated and had a hard time walking at first. The oil rigs in the Gulf of Mexico off the coast of Louisiana are a diver’s paradise with all manner of fish for viewing or spearing, mostly the latter for us undersea hunters. Favorite targets were red snapper and grouper, with lots of Amberjack, large Warsaw Grouper, and huge Jew Fish (also known as the Goliath Grouper) for the more daring. In the sixties the record Jewfish taken spearfishing was 559 pounds. During the summer, the Bajaos met every Wednesday night in the backroom of some bar and planned our adventures for the coming weekend or some upcoming spearfishing rodeo. It was a great life for a 19 year-old kid. The pic is of Buck and me in 1963. 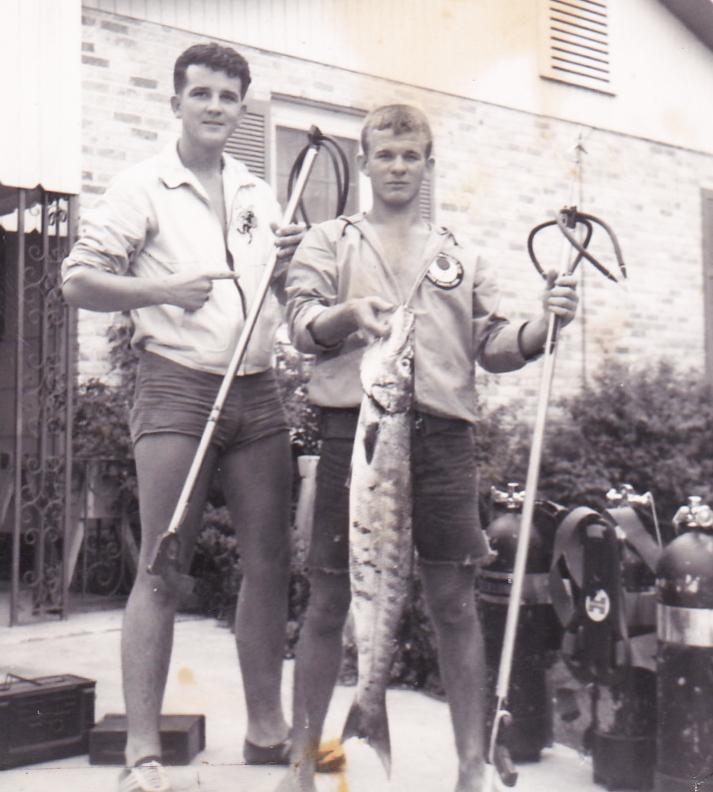 He is holding a Barracuda he shot, and I am holding an empty speargun for the one that broke my line. We switched to stainless steel cable after that.